Travel-Tot: 10 Road Safety Tips for Families! As a parent, safety is always a top priority, whether at home or on the road! Experiencing a breakdown with children in tow can be frightening and stressful. So before you head out on your next family road trip, check out these ten road safety tips to help give you some peace of mind and pave the road ahead for fun! 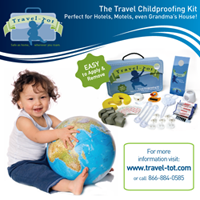 Road Trip Safety Tips: Travel-Tot's Top 10! 1. Before you leave, give your car a quick once-over: check tires to ensure tread and pressure are optimal, check windshield wiper blades and change if necessary, check and top off water level, engine coolant, and washer fluid, check oil level and change if necessary, and check brake lights, headlights, flashers, and blinkers. 2. Discuss road safety with your children and impress upon them how important it is not to distract the driver. 3. Inspect the back seat and ensure that it is clear of hazardous materials or anything your child can choke on. Remove all possible projectiles and store heavy, sharp, or poisonous items in the trunk or in sealed containers out of the reach of children. 4. Acquire some sort of roadside assistance or auto club plan. 5. Always bring along identification and medical information for all passengers in case there is an emergency; the time saved by having this information handy could be the difference between life and death. Ensure that license, insurance, and registration are up to date as well. 7. If possible, share the driving with someone to prevent exhaustion behind the wheel. Pull over if you feel yourself becoming tired. 8. Take frequent breaks. Get out and let everyone stretch their legs, grab a bite to eat, and have a quick pick-me-up (i.e. coffee, tea, other caffeinated beverage) every two to three hours. 9. Familiarize yourself with your vehicle and always obey all traffic regulations. Help prevent accidents by letting the navigator handle the GPS, cell phone, and music or other entertainment. 10. Keep an eye on your fuel situation; refuel as often as necessary.